I have had my fair share of New Year’s Day hangovers, but this year I wanted to spend the first day of the year doing something grounded and peaceful. 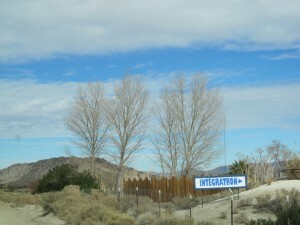 So, when I heard about the “Happily Ever After” New Year’s Day event at the Integratron, I knew that there was no other way I would rather start off 2013. 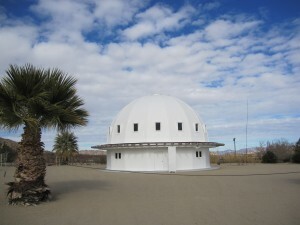 After Van Tassel’s sudden death in 1978, the ownership of the structure changed hands several times before the Karl sisters, Nancy, Joanne, and Patty, bought the Integratron in the early 2000s. Since then, the sisters have been offering sound baths, a type of alternative healing therapy that is similar to a sound meditation, in the only all-wood acoustically perfect sound chamber in the U.S. 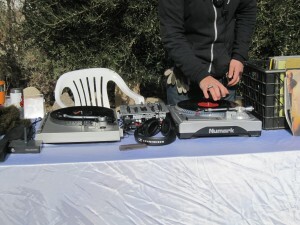 This year, the crew at the Integratron decided to celebrate mankind’s survival through the apocalypses that were supposed to end humanity in 2012, and start the world’s tale of “Happily Ever After” on January 1st, 2013 with a day of music, refreshments, and healing sound baths. 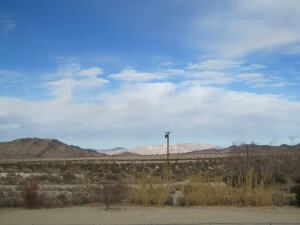 As I drove through the Mojave, I was awestruck by the natural beauty of the expansive desert valleys and the silent power of the surrounding hills. I arrived at the Integratron to find a little outpost composed of several courtyards with small groups of people gathered around warming fires, patiently waiting for their turn to experience the sound bath. As I wandered around the courtyards, I came across a range of unique pieces of art, a hammock garden, and a table where DJ Mahatma Grande spun an excellent selection of relaxed tunes from Cat Power to Talking Heads to T. Rex. 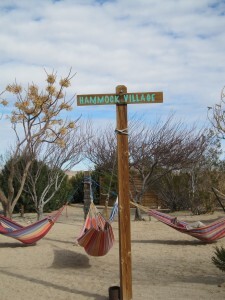 As attendees milled about, they enjoyed hot chai, coffee, and fresh grilled cheese sandwiches, and exchanged stories about what brought them to the Integratron on a New Year’s Day. After a short while, people with pleasant, sleepy faces began to trickle out of the great white dome and an announcement was made that the next sound bath would begin in a few minutes. Those of us who had been waiting filed into the bottom floor of the structure, where we were asked to remove our shoes, and then we were allowed to ascend the ladder up to the second floor. As soon as I stepped into the upper floor of the dome, I noticed how light and open it was inside. The dome was created without any metal and consists primarily of large beams of wood wrapped into a perfect dome, held together by a cement ring at the top center of the structure. 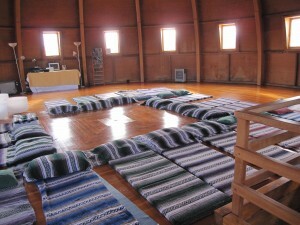 As our group prepared for the sound bath by lying down on mats and getting comfortable with pillows and blankets, Joanne Karl told us a little bit about the history of the structure and the theory behind the sound bath. After we were all settled, Joanne began to play the first in a series of seven quartz crystal singing bowls, each of which are keyed to tones that are supposed to resonate through the seven chakras of the body in sequence from the root chakra to the crown chakra. She used a small mallet to tap the side of the bowl to create a sonic vibration and then moved the mallet around the bowl to amplify the sound and send the tone throughout the dome in powerful waves. Joanne played the crystal bowls, one at a time, for about a half hour as the rest of us lied still on our mats and let the entrancing sound envelop us. For different people, the experience of the sound bath varies. For some, it is an intensely spiritual experience that elicits a transcendent state. For others, it offers deep relaxation and stress release, and then there are those who find it to be simply a meditative exercise that offers another way to tune into the present. For me, it was a way to start out the year in beautiful place with new people who are seeking ways to develop a greater sense of overall wellbeing and peace. 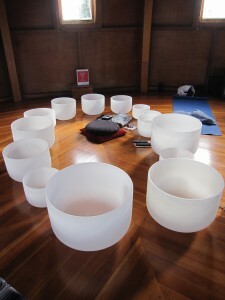 When Joanne finished playing the last crystal bowl, she put some very gentle music on to play quietly and then tiptoed out of the room, leaving us to rest and continue to receive the effects of the sound bath, much in the same way savasana allows yogis to receive the full benefit of their practice. Slowly, people began to stir, gather their belongings, and make their way out of the dome and back into the outdoor courtyards. Many of us gravitated toward one of the warming fires and chatted quietly while we listened to the tunes being spun by the DJ. We continued to let the soothing effects of the sound bath cloak us, and as I watched the clouds move slowly across the sky and the sun shining down on the desert, I knew that I had found exactly what I was looking for.